Laura Loomer Showed up at the Women's March, Screaming "What About the Jews?" "The Women's March does not represent Jewish people," she yelled, adding that the Women's March was a Nazi organization. Security escorted Loomer off stage, but she didn't leave without repeatedly screaming at the crowd: "What about the Jews?" 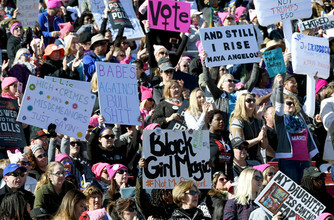 Thousands arrived at the nation's capital for the third year of the rally, despite the Women's March organization spending the majority of last year in utter chaos. Top members within the organization were accused of anti-Semitism after one of the organization's founders, Vanessa Wruble, claimed she was pushed out of the group because of her Jewish heritage.